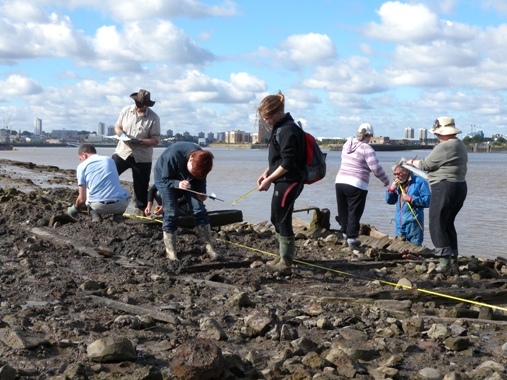 The Heritage Lottery funded Thames Discovery Programme (TDP), which ran from October 2008 to September 2011, had two intertwined strands, combining fieldwork with public outreach. The project was managed by the Thames Estuary Partnership and the Thames Explorer Trust. The TDP Community Archaeologists undertook a new archaeological survey of the exposed and threatened sites on the foreshore. This new survey updated and extended the original Thames Archaeological Survey, which first recorded foreshore archaeology in London, during the 1990s. Public particpation was actively encouraged in the recording and subsequent monitoring of these threatened sites, and over 300 volunteers were trained by the TDP to be members of the Foreshore Recording & Observation Group or FROG. The FROG systematically monitors the 20 key sites on a regular basis, providing a long-term sustainable future for the monitoring and enjoyment of the river’s historic maritime heritage. 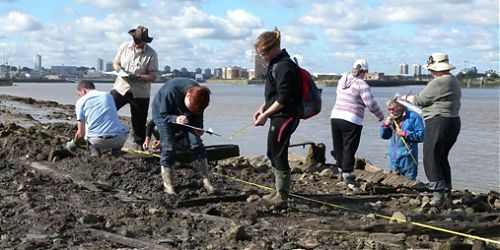 The outreach project worked with the wider community in Greater London, to encourage participation and interest in the history and archaeology of the Thames foreshore. This was undertaken through a programme of special events, information days, public exhibitions, the creation and presentation of educational materials for schools and the development of this website. You can read more about the HLF phase of the project in the Community Archaeology Report, which is online here.